CINCINNATI — It has been nearly two weeks since media reports first raised then swatted down the prospect of a Target Corp. merger with the Kroger Co.
And what have we learned? The deal might make sense from a territorial point of view but not so much in financial terms. The idea captured Wall Street’s attention for just a few hours. Fast Company magazine, citing several anonymous sources, said Kroger and Target were discussing a merger. CNBC, citing one anonymous source, said they were not . Both companies declined to comment on the speculation. Barclay’s analyst Karen Short published a note arguing the idea made some sense. Oppenheimer’s Rupesh Parikh said the most likely outcome is a partnership between the companies involving Shipt, a home-delivery service Target acquired in December. 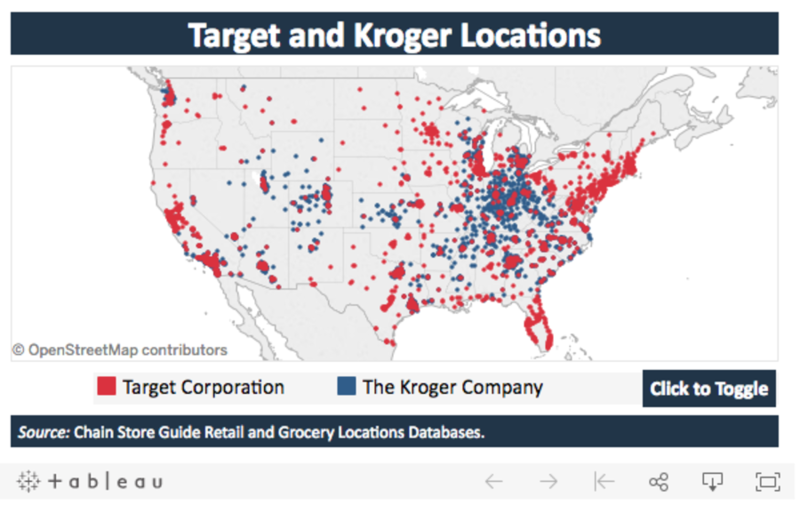 Chain Store Guide mapped out the footprints of both companies in a graphic that shows all Kroger locations in blue and Target stores in red. One thing that’s evident from the map is the lack of overlap between these retail giants. These map suggests Kroger could expand its reach if it joined forces with Target, gaining access to new customers in Florida, the Gulf Coast and the Northeastern United States. A review of company disclosures by Scripps station WCPO in Cincinnati shows Target has more than 500 stores in 15 states where Kroger does not currently have a presence. By contrast, there are 16 states where Kroger has at least three times more supermarkets than Target stores. In other words, at least in terms of real estate, a merger might make sense. On the surface there are some pros and cons,” said Joe Edelstein, equity analyst for Johnson Investment Counsel. Beyond the geographic gains, Edelstein said the business models of Kroger and Target are complementary. Kroger generates the bulk of its revenue from groceries, Target from general merchandise like apparel and home goods. “Combining the traffic-driving nature of groceries with general merchandise certainly could help make the combined company more competitive in the long run,” Edelstein said. The combined companies would have more than 4,600 stores, nearly 850,000 employees and revenue approaching $200 billion. Walmart’s still much bigger, with $500 billion in 2017 revenue. But Edelstein said a combined Kroger and Target would be able to gain some additional buying power with its increased scale. That would improve its prospects against Amazon, which is growing rapidly in both groceries and general merchandise. But the companies would also face new complexities in its merchandising approach. The average Kroger store generates about $35 million a year from grocery sales; the average Target, about $8 million. Debt is another problem. Kroger has more than $15 billion on its balance sheet, Target more than $11 billion. Because Target is the bigger company with $37 billion in market value, compared to Kroger's $20 billion, it would likely be the acquiring company. But the amount of new debt it would take to accomplish that could threaten the investment-grade debt ratings both companies are trying to maintain. That’s why many have moved on from the tantalizing speculation of a Kroger-Target merger. Morningstar analyst John Brick declined to comment on the topic because a deal is not likely to happen. Morningstar forwarded an October report in which Brick outlined his expectation that Kroger would pursue “fill-in acquisitions” that don’t strain the balance sheet. “We also believe the company could continue to make acquisitions to enter new markets, but given the prudence Kroger has exhibited in its past pursuits, we don’t think any deals would weigh unduly on the company’s financial position,” he wrote.